This AIP Pumpkin Spice Granola is the perfect treat regardless of the season. It’s nut free, sweet and salty, and perfectly crispy. Whether or not you eat gluten free diet, this Pumpkin Spice Granola is sure to become your favorite recipe. Finally! A healthy, gluten free, nut free, and AIP Pumpkin Spice Granola! This autoimmune protocol friendly Pumpkin Spice Granola is perfect no matter the application. You can use it to top my Caramel Apple Parfaits, enjoy it straight out of hand, or in a bowl with coconut milk. It’s nut free, crunchy, and slightly sweet and spicy. 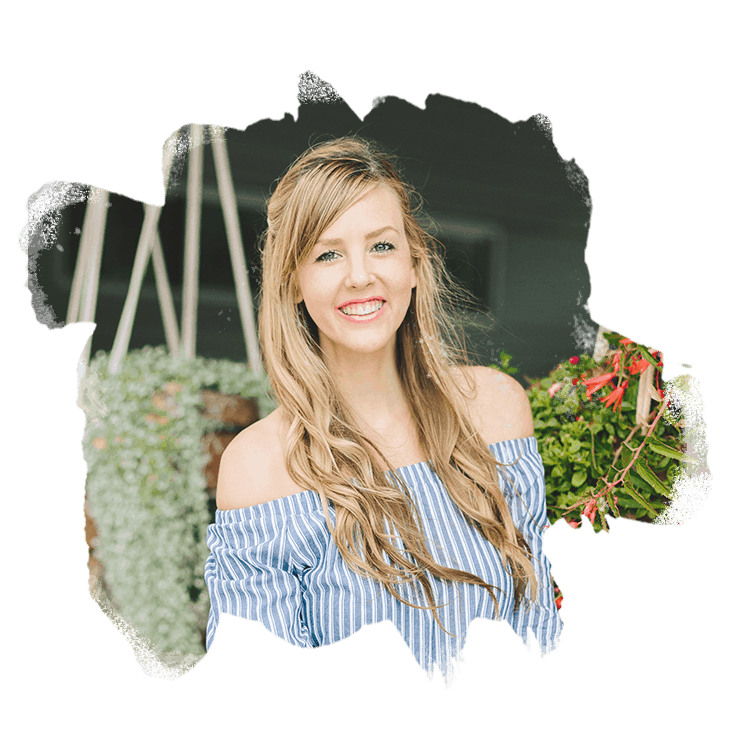 A couple of years ago, I partnered up with two blogger friends to make a free holiday cookie ebook, Paleo Cookie Exchange. 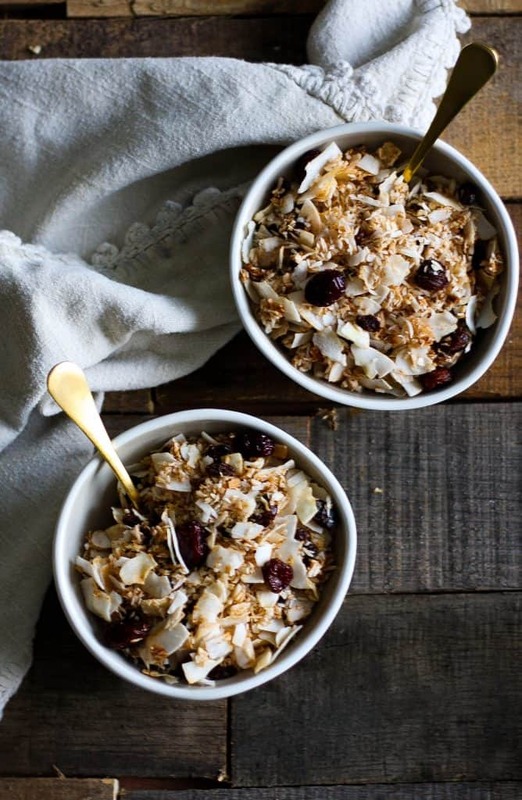 Included in it is a recipe called Coconut Cinnamon Toast Crunch, which is a combination of maple sweetened coconut flakes, toasted pecans, and ground cinnamon. 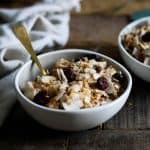 This year my friends and I decided to expand our ebook with a few new recipes, and I knew I wanted to do an AIP compliant spin-off on my previous “coconut cereal”. The first granola recipe I created tasted like Cinnamon Toast Crunch, while this AIP Pumpkin Spice Granola recipe tastes like the most delicious Raisin Bran imaginable. The combination of ground cinnamon and ground ginger, in addition to sea salt and maple is just the perfect amount of fall sweetness. 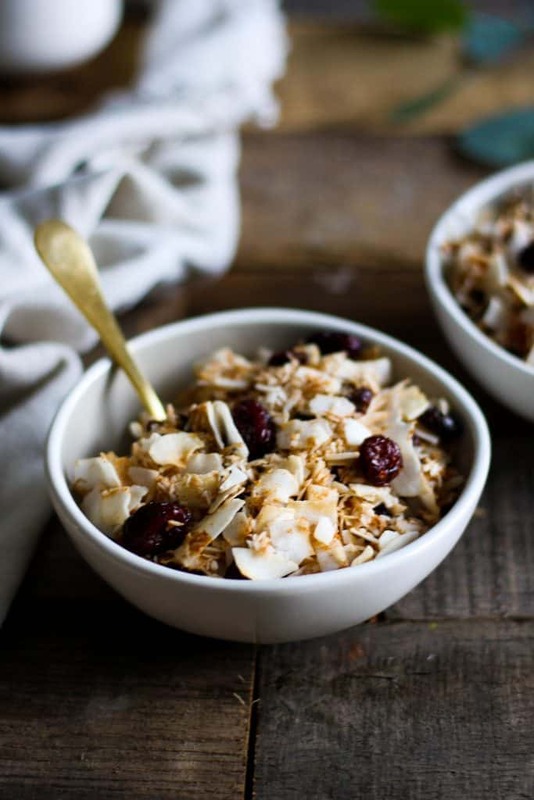 The raisins and cherries add a pop of flavor and chewy texture opposite the crispy coconut flakes. Despite having prepped at least one batch of this AIP Pumpkin Spice Granola every week since August, my family hasn’t grown tired of it yet. As a result, we’ll pack it in our lunches to eat by the handful, and enjoy it as dessert with coconut milk poured on top. You better believe we make a second batch if we run out early in the week! While I don’t often say this about my recipes, this AIP Pumpkin Spice Granola blows my former Coconut Cinnamon Toast Crunch straight out of the water. My goal with creating AIP recipes is always to include a few healing ingredients, and this AIP Pumpkin Spice Granola isn’t any different. So if you’re looking for a healthy and healing treat, look no further. 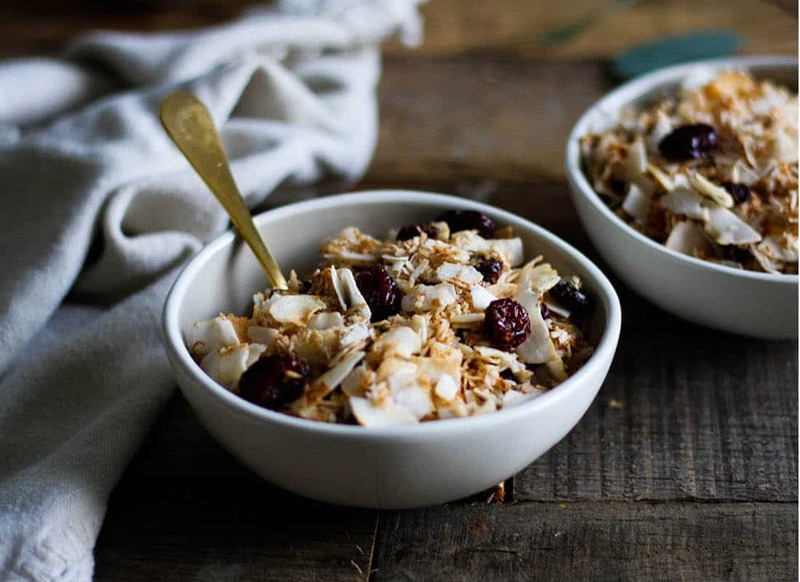 Combine coconut, raisins, and cherries in a large bowl. Add maple syrup, cinnamon, ginger, and sea salt. Stir with a spatula until the coconut and fruit are well coated. Spread out on a parchment lined baking sheet, and bake for about 10-15 minutes, stirring after about 7 minutes of baking time. Remove from oven when the coconut flakes are golden brown, and let cool on baking sheet. The coconut flakes will crisp and form larger clumps as they cool.